Amos William Harbaugh was born on June 5, 1867 on a farm at what is now Clairton Lake near Scullton, Somerset County, PA, the son of David and Mary Magdalene (Whipkey) Harbaugh. 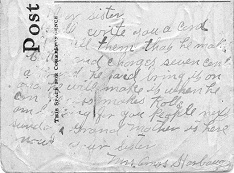 On June 22, 1893, at the age of 26, Amos married 23-year-old Elnora "Nora" M. Cramer (1870-1925), the daughter of Samuel J. and Rosanna "Rosie" Cramer. They lived for many years in Middlecreek Township, Somerset County, and had one daughter, Ruby Marie Miller Peck. When the federal census was taken in 1900, the Harbaughs' home was in Middlecreek, and Amos was listed as a farmer. They lived next door to Nora's widowed mother. Again in 1910, the family was enumerated in the government censuses as farmers in Middlecreek. Tell them that he makes butter and charges seven cents a Pound. He said bring it on and he will make it when he can. [Illegible] makes Rolls. Am looking for you people next Sunday. Grand Mother is here now. In mid-June 1914, the Harbaughs learned of the horrifying murder of William S. Trimpey of Kingwood at the hands of Nora's kinsman Henry C. Cramer, a blacksmith of Kingwood. Trimpey was the son of John S. and Nancy (Younkin) Trimpey and grandson of Frederick F. and Sarah (Faidley) Younkin, and Cramer was the son of Charles R. and Katy (Whipkey) Cramer. The Somerset Herald reported that "the tragedy culminates a feud between Trimpey and Cramer of about a year's standing" involving Trimpey's use of Cramer's private road. Said the Herald: "It is alleged that Cramer concealed himself behind a maple tree and opened fire on Trimpey with a double-barrel shotgun while the latter was tearing down a fence across a private road. Trimpey was shot in the abdomen, his intestines and bladder being punctured." Amos was called to testify at the resulting trial, and told jurors that he had brought one or more horses to Cramer's blacksmith shop earlier in the day before the killing took place. Amos needed to have the horses shod, and when discovering Cramer was not there, nailed three shoes himself. When Cramer returned, Amos asked him to drive three more shoes, but Cramer declined saying it would ruin his "calculations." He also told Amos that Trimpey had removed the fence. The case was covered in great detail in the Herald. Cramer was convicted in 1914, and was incarcerated in Rockville State Prison until his death four years later, in 1918. In 2000, the articles were reprinted in the booklet Commonwealth vs. Cramer, compiled by Linda L. Marker, BA, MSW. She wrote: "The Cramer trial attracted more interest than any proceeding heard in the county court since the famous trial of the Nicely brothers, in 1890." Amos and Nora again received the shocking news in April 1918 that their son in law Earl D. Miller had drowned. Their grieving daughter Ruby returned to their home, where she lived until she married again a few years later. The census of 1920 shows the family together under one roof. ...About 2 o'clock the family were awakened by her, stating that her breathing was affected, but assuring them it was nothing to be alarmed about. Dr. G.F. Speicher was summoned on the Harbaugh home, only to pronounce that she had gone to her reward about thirty minutes before his arrival. [She] was conscious to the last, with her last breath saying: 'I am going,' and pressing a parting kiss on her daughter's lips, who was holding her in the open air when the end came, she departed this life with a smile of peace on her countenance. 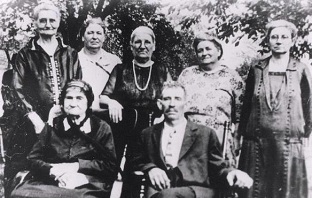 The year after Nora died, Amos is known to have attended his mother's 94th birthday party in August 1926, at the old Harbaugh family homestead. The event drew a crowd of 225 people, and was so successful that it became an annual event, what is now the Harbaugh Reunion. Many photographs were taken that day. In a large panorama photograph, showing the entire crowd in attendance, Amos sits near his mother and holds a boy on his lap, presumably his grandson Loren Peck. Less than two years later, in March 1928, Amos contracted a case of lobar pneumonia and died at home, four days later and at the age of 61, on March 8, 1928. He was buried beside Nora at the Rockwood IOOF Cemetery.